1. Screenshots would lead to confusion from people only casually interested in Amiga stuff (i.e. they don't own an OS4 or AROS machine yet), as they may get mixed-up about what screenshots are of OS4 stuff & what are of AROS stuff. That could lead to some very disappointed people, if they buy the "wrong" machine, and then find out it won't do what they thought a screenshot showed. 2. It is disrespectful to blatantly rip-off the look which the OS4 guys spent a lot of effort creating & polishing. 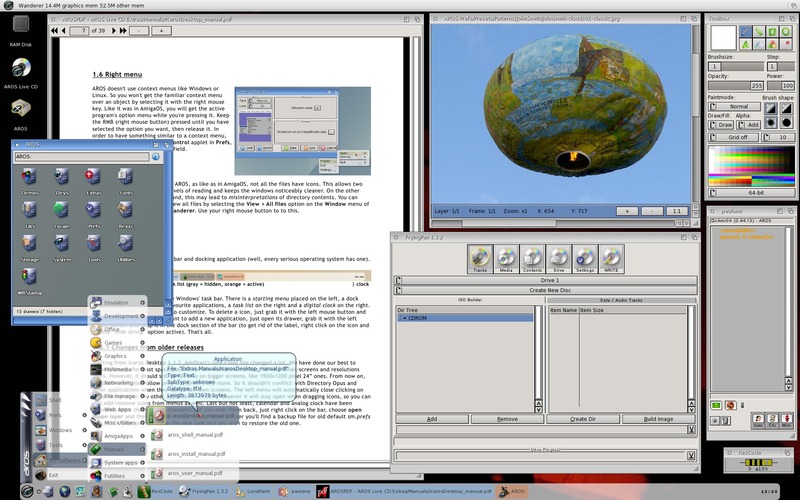 Initially I thought I was looking at a MorphOS screenshot, and it was only after I noticed some small details (e.g. "Wanderer" in the screen titlebar) that I realised it was actually an AROS screenshot. 1. Screenshots will lead to confusion from people only casually interested in Amiga stuff (i.e. they don't own a MorphOS or AROS machine yet), as they may get mixed-up about what screenshots are of MOS stuff & what are of AROS stuff. That could lead to some very disappointed people, if they buy the "wrong" machine, and then find out it won't do what they thought a screenshot showed. 2. It is disrespectful to blatantly rip-off the look which the MorphOS guys spent a lot of effort creating & polishing. And while I don't wish to speak for MorphOS users, I can surely imagine it will upset some of those users too. Which I doubt the author of the them wants to see. Of course I would also object to seeing a MOS theme on OS4, or an OS4 theme on MOS, or an AROS theme on OS4/MOS. I am merely using examples that I've actually seen. Last edited by ChrisH on 01-Sep-2012 at 11:49 AM. Last edited by ChrisH on 01-Sep-2012 at 11:47 AM. Thank God Chris! This forum was starting to look like a normal forum until this thread! Last edited by Cool_amigaN on 01-Sep-2012 at 02:59 PM. Why do you start this stupid and senseless thread? I was in the past for cooperation and because of nonsense like this I am more and more against (with negative feelings). Why do you not just stop? Don�t you have more important things to do? I compliantly agree, I think there are some people try to confuse people in to getting what they wont, some people are trying to fake it, instead of promoting what better about there operating systems. We have a phrase here "Aus einer M�cke einen Elefanten machen" that means to make a problem where no problem is. Someone uses a theme that is not official because he likes it and posts a screenshot. So what? When this is already a problem then we are really at the end. Then we should split and never work together to avoid any discussion or misunderstanding. and then find out it won't do what they thought a screenshot showed. If I am not mistaken, the screenshot shows Annotate running. So what could I think, because of this screenshot, that AROS could run, that it wont ? BTW. I personally think, that AROS should not use OS4 or MorphOS Themes. 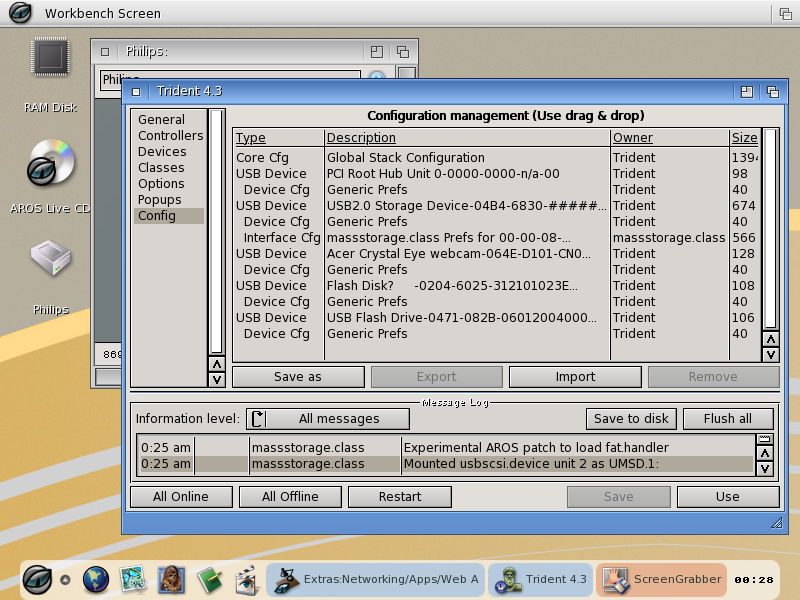 The OS4 Theme looks toy'ish and the MorphOS Theme (while looking really professional and clear) does not look like AmigaOS at all. I like the standard AROS Theme, because it reminds of the Workbench 1.3 look. Maybe with different Colours and a little polished, it would be more accepted. if he recreated it, it is legal(unless of course Morphos has design patents). There is a ton of case law to prove it. Just be honest you don't like the idea. That is illegal, because it breaks copyright law... unless they have the permission of the copyright holder (which I doubt). So isn't that like asking someone if they beat their wife when you have no clue of it happening? Your making a serious charge without asking the author of it's situation, why? Why are you casting a wide net to defame AROS when it's down to a single individual's private work who you don't know if they are complying with the code's license or not? What you're observing is the GUI toolkit theme, not the OS itself. MUI is common to AROS and MorphOS, so of course skins will be interchangeable. I do see where you're coming from (although I think you're rather hasty to be throwing the word 'illegal' about - given OS4-team's history with alternative Amiga-OSes and allegations of illegality, it's perhaps an unwise path to choose), but would you also suggest a linux distribution using the same GTK settings as another Linux distro would be 'illegal'? How does that leave OS4/AROS/MorphOS XP-like themes, etc? Last edited by Boot_WB on 01-Sep-2012 at 01:23 PM. Last edited by Boot_WB on 01-Sep-2012 at 01:21 PM. Troll - n., A disenfranchised former potential customer who remains interested enough to stay informed and express critical opinions. opp., the vast majority who voted silently with their feet. Every time there is some positive news about AROS or MorphOS, certain users seem to feel the need to "protect" their OS4. They dont understand that they really dont help OS4 and its users, but instead doing harm to the general image of OS4 and its users. Fortunately most users here understand that cooperation between the different Camps is the key to have some kind of success in the future. Ok, so let's just start with alerting Microsoft to this clear illegal copyright infringement of OS4, shall we? Or maybe we'll just stop being ridiculous fanboys and let people customize their GUI however they want? Last edited by Kicko on 01-Sep-2012 at 01:46 PM. Let's have a list of officialy approved themes for Win, Linux, OS X, Unix... users, so that we do not hurt your or other OS4 users feelings... afterall, you did pay a hefty sum of money so why should the rest of us be able to have the same feel or look for next to nothing... right? Since when using a theme is illegal?. Amiga 500 1 mb ECS Power!!! Mac Mini G4 1GB Ram with the butterfly!! It is OK to mimic theme from another OS but of course not copy paste the original artwork. I dont know how legal it is to clone original artwork --- to my understanding it is legal if you give credit to the original artwork and dont claim it was your idea. Anyway, this Ferox theme clone on AROS is very badly done. The text is not properly aligned and some buttons are out of place (see up and down arrows) and MUI/Zune is not using Ferox theme at all. I take it as compliment that someone want Ferox theme on his AROS box but it really bothers me it looks like sh*t. Sorry, it does really look like sh*t if you have seen the original. This thread is a troll, right?